An innovative new electronic cycle jacket Visijax® has been launched by British company Li & Co Ltd, which will improve the safety and visibility of cyclists and aims to reduce the numbers of cycling accidents. According to road safety experts RoSPA, turning in front of fast moving vehicles is one of the biggest hazards faced by riders. In direct response to this issue, Li & Co has developed cutting-edge technology, ‘Intelligent Motion-Activated Signalling System’ (iMASS ™) and ‘implanted’ it within the high-design Visijax® commuter cycling jacket. 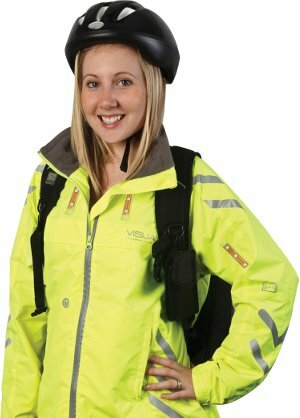 This new feature, unique to the Visijax® jacket, detects movement so when a cyclist raises their arm to indicate, an amber flashing signal is automatically turned on, which can be seen clearly by motorists and other cyclists on the roads. The flashing signal remains on for around five seconds after a cyclist has put down their arm to allow sufficient time for them to turn safely. Supporting the iMASS™ system, are 23 integrated high intensity LED lights arranged in clusters with standard vehicle lighting codes i.e. white for the front and red for the rear. For additional cyclist safety, the lights on the back of the jacket are positioned in a backpack-friendly area so cyclists can be seen clearly from behind. The complete system is powered by three AAA batteries, which have a total life of 200 hours – a ‘one-touch’ button placed in the front of the jacket activates all lights and the iMASS™ system. Visijax® has been developed with all areas of cycle safety and comfort inmind. Visijax® is currently available exclusively at www.amazon.co.uk for an introductory price of £129* (offer ends 31st May 2012.) Visijax® will be available internationally from Autumn 2012. Win your very own? Here is how. Competition ends Midnight (GMT) 20th May 2012. A winner will be selected at random by Visijax. Their decision is final.